Tom Sawyer is very likely one of the pearl of the Nippon Animation Studio. This studio is mainly known for the “World Masterpiece Theater”: under this label, there are many animes which are all based on a classic western novel. 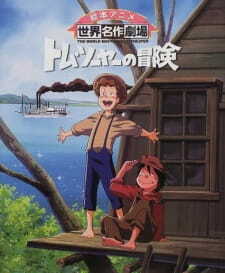 The scene takes place in a town close to the Mississippi river in the 19th century USA, and we followed the fantastic adventure of the young Tom Sawyer and his friends. The art and animation are very satisfactory for an anime of this generation. Like other Nippon animation anime, the general work is less “Manga style” than usual (no blue hair or galaxy like eyes), very likely to stick more with its literary source. The target audience is obviously the children. All the ingredients that will make a child dream of marvelous adventures are gathered here. The strength of this anime is the very naturalistic aspect of all the environments and the plausibility of the personality of each character (children or adults) making this anime quite realistic from a western standpoint and it will surely awake the little child who sleep in everyone of us. The music by its funny aspects and the use of traditional instruments match perfectly the action and the astuteness of our young hero. Overall, this anime will entice positively a young audience by the inner nature of Tom Sawyer and his adventures but will raise interest among older viewers by its naturalistic aspects as well…Let’s play the pirate on the Mississippi!